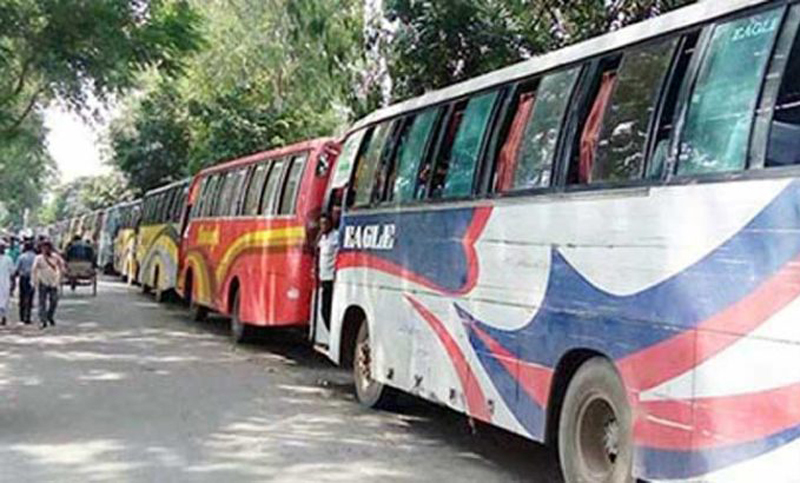 Traffic jam continued on both sides of Paturia-Daulatdia ferry route due to the shortage of ferries and strong current in the river, causing immense sufferings to Eid-ul-Azha holidaymakers. At least six hundred vehicles were seen stuck and queued up at Daulatdia ferry ghat in Rajbari around 9 am toady. Hundreds of passenger buses, 60 to 70 cattle and goods laden trucks, covered vehicles, and other vehicles remained stranded at Daulatdia ghat. Bangladesh Inland Water Transport Corporation (BIWTC) Daulatdia Ghat Assistant Manager (Trade) Md. Abu Abdullah said: " It is taking time to cross the river because of strong current in the river. So the queue of vehicles is gradually increasing.